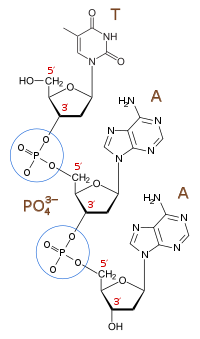 Diagram of phosphodiester bonds (PO43−) between three nucleotides. A phosphodiester bond occurs when exactly two of the hydroxyl groups in phosphoric acid react with hydroxyl groups on other molecules to form two ester bonds. Phosphodiester bonds are central to all life on Earth as they make up the backbone of the strands of nucleic acid. In DNA and RNA, the phosphodiester bond is the linkage between the 3' carbon atom of one sugar molecule and the 5' carbon atom of another, deoxyribose in DNA and ribose in RNA. Strong covalent bonds form between the phosphate group and two 5-carbon ring carbohydrates (pentoses) over two ester bonds. The phosphate groups in the phosphodiester bond are negatively charged. Because the phosphate groups have a pKa near 0, they are negatively charged at pH 7. This repulsion forces the phosphates to take opposite sides of the DNA strands and is neutralized by proteins (histones), metal ions such as magnesium, and polyamines. In order for the phosphodiester bond to be formed and the nucleotides to be joined, the tri-phosphate or di-phosphate forms of the nucleotide building blocks are broken apart to give off energy required to drive the enzyme-catalyzed reaction. When a single phosphate or two phosphates known as pyrophosphates break away and catalyze the reaction, the phosphodiester bond is formed. Hydrolysis of phosphodiester bonds can be catalyzed by the action of phosphodiesterases which play an important role in repairing DNA sequences. The phosphodiester linkage between two ribonucleotides can be broken by alkaline hydrolysis, whereas the linkage between two deoxyribonucleotides is more stable under these conditions. The relative ease of RNA hydrolysis is an effect of the presence of the 2' hydroxyl group. A phosphodiesterase is an enzyme that catalyzes the hydrolysis of phosphodiester bonds, for instance a bond in a molecule of cyclic AMP or cyclic GMP. An enzyme that plays an important role in the repair of oxidative DNA damage is the 3'-phosphodiesterase. During the replication of DNA, there is a hole between the phosphates in the backbone left by DNA polymerase I. DNA ligase is able to form a phosphodiester bond between the nucleotides. ^ "Phosphodiester bond". School of BioMedical Sciences Wiki. ^ Plaisance, Laplace (2007). Fundamental Biochemistry (3 ed.). McGraf Educational. pp. 331–334. ^ Kulkarni; et al. (2008). Biochemistry. Pragati Books. pp. 57–60. ^ Alberts; et al. (2017). Molecular Biology of the Cell (6 ed.). Garland Science. p. 240.